“So, what was your job like, man?” Eddie asked to the King shepherd sitting on the seat row in front of him. “What do you mean?” Dasco asked back, unfazed. This made the youngest human of the group to fall silent, while their car ran toward the core cluster of Xanadu. Iris kept looking at the panorama around them and visible under their feet. The car’s frailty was apparent, as it was made of plasteel and could stand a bazooka shot. “It’s so beautiful,” she muttered, feeling like a puppy during her first exploration of the world. “Sir?” she then asked to the black wolf standing near the door, together with that silent Natalie Domina woman. Speaking of ‘standing’, their Captain hadn’t taken a second to rest since ‘welcoming’ the group. “Uh, this area was hit by an earthquake, once. In fact, the old Truman Laboratories were shut down due to leaks caused in the fissile material storage tanks. Isn’t it dangerous to have a nuclear fusion reactor here, of all places?” Especially considering that the thing was supposed to revolution the energy market forever. The wolf nodded. “First of all, Prometheus is supposed to just turn off, in case of structural emergency. The plasma core smothers itself like a candle fire. No fancy explosion, sorry for the drama lovers. The real mess will be turning it on, as that process requires a very generous injection of energy. Sarah and Catherine nodded. This was their territory, international espionage. It was a safe bet that an hostile party would not rely on microphones and the such –no unapproved transmission could leave this place or reach it. And it was as much clear that privacy was nonexistent. No one could ask for a ‘personal favor’ without Big Brother knowing. This left room to good ol’ spies only. Now, that was something hard to catch, unless you were a pro. Like a CIA spook and the daughter of a former top KGB Agent. The car stopped over the roof of the central building. Temno examined his ‘troops’: plasteel plates body armor, emergency kits (including ‘invisible cloak’ and AR contacts), HUD glasses and cameras which allowed each member of a single team to keep track of the other, skin communicators powered by the body heat, smartphones GT Omivac-Z3, sleeve stunners, GT Hyperflash neural grenades NG MIII, C5 explosive pack, boot knives. Then came the weapons of choice, what humans and animals had decided to keep as personal item. Of course, their armory held enough bounty to last for World War III and some year later, but a good soldier would stuck to those weapons he or she would use more frequently. In this case, Jake Torrance’s question was not really unfounded. Archer had kept his arrows, his ‘Hawkeye’ quiver and his own compound bow. Considering he could turn any object into a weapon thanks to his exceptionsl marksmanship, he really wasn’t disarmed without bow and arrow. Edward Pope Jr. now owned a PSE TAC 15 crossbow, his own quiver, and a SIG Sauer P238 loaded with six GT C5 fragmentation bullets. Chance showed no visible weapons, but only because his vest contained anything he needed to be dangerous and taking his enemies by surprise. The cat had dubbed that vest his ‘Bat-belt’. Like him, Clayton Whitaker was good with an assortment of weapons, but since he excelled at short range combat and preferred to be of support to Chance, he had chosen a “Ranger” combat trench survival knife, a Tomahawk knife, and a KSG Kel-Tec Shotgun. Sodina and Catherine Panderov had eventually gone for items that could make their own bodies more lethal –retractable wrist claws GT M1 ‘Predator’, gloves reinforced with titanium layers, reinforced boots with hidden knives, and telescopic batons strapped to their arms. Flare and Fredrick, who had trained to think and work as one, a requirement in their kind of specialty, carried a classical piece each: AK-47, and a bag to reassemble it according to necessity. Whatever else they needed, in case of defusing explosives or setting them, they carried it in their backpacks. Lance and Jake carried each an XM-25 rifle by Alliance Techsystems, still to go on the market, and a multipurpose knife. Other than that, they too had their own backpacks –and no one still knew what was inside them. Amar had chosen two items: As a spotter, his job was to be silent. All he needed were a Leonida Combat Survival Knife, and a GT SF-01 ‘StarField’ Spotting Scope. His partner, Elsa, carried a disassembled M107A1 in a hard bag strapped around her shoulders. That, combined with her talent, made her one of the most lethal women in the world. Navy and Caleb couldn’t refuse their standard attire, and they really, really hated to use lethal weapons. So both had opted as well for the GT SK-08. Caleb had added a Taser X12 Stun gun for longer range shots. After all, they were basically negotiators. Right? To say that Marcus liked overkill, there was no doubt: after a long debate with himself, and Temno’s refusal to hire a Sherpa, the dire wolf had kept his Smith & Wesson Bush Hog Kukri and the SOG cutting knife. He had strapped a Beretta M92 with 9x19 prabellum rounds to his thigh…and had replaced his first choice with two novelties: The Auto Assault AA-12 shotgun, and a Pfeifer-Zeliska .600 Nitro Express Magnum! A weapon that only one like him could fire like a ‘normal’ gun’. Damien, with his M4 Carbine with Grenade Launcher and his D2 Extreme Fighting Ka-Bar, looked small and inadequate! Dasco had his Magpul FMG9 folding machine gun, a FNH Five SeveN ODG, and a Cold Steel Recon 1 Knife. Rusty was equipped with an M4 Carbine, a Beretta M9 pistol and a Walther P99C. All in all, a sight to fear. The elevator doors opened on a large meeting room –as local architecture went, a room occupying the whole floor. It must be an interesting show, when it was filled to capacity with scientists discussing over their pet project. For now, it was just an empty amphitheater, the set for some post-apocalypse movie. Eerie. “Beak! I told you guys we needed to work on the scent factor!” An incorporeal male voice said…a moment before a crowd filling the room to capacity appeared out of nowhere! Men, women and animals, all wearing their clothes and coats! At the same moment, every single team member carrying a gun produced it and cocked it, aiming at the crowd! The warriors lowered their weapons. “Just. Don’t. Do. That. Again,” Marcus growled, lowering his AA-12. The man stepped forward, He was accompanied by a Russian Blue cat. A graceful, pretty female Russian Blue cat. “I think I am being in love,” Amar said. “Saw her first,” Chance whispered. Marcus was looking at Wayward as if the human was an alien –how was he supposed to instill fear in the enemy if he didn’t even instill awe in this…puny creature?! Jake and Lance were examining the crowd. The two newly elected guns for hire were actually drooling at the sight! “I love my job,” Lance said. “And build our future,” a German male scientist said. His tag read FRIGSBURG. “And doesn’t this give you…loyalty problems”? Iris asked. As a dog, loyalty was something built in her DNA. As a CIA agent, she couldn’t see herself giving her talents to any other country than hers. “Especially my country,” a Mr. DONADIO said. He looked like the grumpy guy of that bunch. He also looked a lot like a younger Michael Ironside. He was accompanied by a female Boxer. “If I told you just how much cash our politicians spent for their own bordello pleasures instead of financing research…” He was becoming all red in the face. “I want their puppies,” Lance whimpered. “Who is caring?” Amar shrugged. “I…like a good competition,” he said to the Russian Blue, correcting himself at the last moment. He didn’t usually care about his speech, but all of a sudden he wished he was more sophisticated. “GRUNTS!” Temno roared. The mercenaries sprung on attention. “Sir!” Archer raised his paw. After he and his partner had left the room, a long silence fell while the guns for hire looked at the civilians. Eddie cleared his throat. He felt as if he was about to get flunked at an exam. Eddie remembered that examining commission guy saying the same thing. Before a painful F hit him in history. His old man had eaten him alive, at dinner…were those fangs in this Spanish guy’s mouth? He needed air! “Didn’t he try to kill you?” Donadio asked. “Once you get past the wish to strangle them, I guess,” Catherine whispered back. Shirakawa nodded. “We need recreation from time to time, fresh air, meet other people, but we are not stupid. We are well aware of the historical importance of our jobs. The work of the other Clusters is important, but it’s nothing compared to this. In fact, they depend on us giving them the fire to feed their products and the industry manufacturing them. Galvan looked at the cup’s content. He seemed puzzled. “Hmm, I think I may have taken the liquid nitrogen by mistake. Here, let me try.” He took the cup and emptied it with a couple of gulps! Eddie saw his career dying in front of his eyes and his body grinded for his uncle’s next lunch! But Eddie had fainted again. Last edited by valerio on Fri Mar 08, 2013 4:09 am, edited 3 times in total. well I'm not sure I pictured Iris with dual katanas, but It fits. plus, I love dual wield katanas. plus yeas, stun gun is very much her. as for Sarah, yes, those weapons sound about right. though keep in mind, she'd only use one at a time because shooting with two hands has higher accuracy. but having two means more shots before needing to reload. I'm enjoying seeing more of them interacting. I look forward to seeing them do their jobs. Love that Marcus's main gun is the AA-12! That shotgun is amazing! I had completely forgotten about it. The special Frag-12 round comes in three different variations. Explosive, armor piercing, and fragmentation. A gun that truly is a perfect weapon for a Dire Wolf that enjoys killing and will do so without hesitation. Oh and then there is the Pfeifer Zeliska .600 Nitro Express revolver. Considered one of the most powerful handguns in the world! Love these guns. If you say that those eggheads actually made a functioning Railgun or also known as a Mass Accelerator Cannon/Magnetic Accelerator Cannon then I will die. You can bet it, they are developing that as well at Red Cluster. I didn't want to introduce it now because it's still a cumbersome affair, and I want a fairly portable device. Today this ficcie has reached the 100,000 hits! Please allow me a moment of pride while you all get this extra-bonus: a big thank you from the couple that started it all...and the new generations! With extra superduper spoiler added. And a big, genuine and humble THANK YOU for being with me and my rants so far! Last edited by valerio on Fri Mar 08, 2013 3:01 am, edited 3 times in total. You really keep adding more characters that I hope you keep track and I know you do. As for 100,000 hits pic, really CUTE and MAGNIFICENT! Stu did a spectacular job even with the shadow. Aw, Pixel is such a jinx. Well, of course this is just an introductory episode, so not everyone is mishmashed in a row. I'll try to cover as much as possible and keep your interest going, before going back to the Gardens and Terrace. I have have plans for everyone. GT SK-08 = Gottschalk Technologies Stun/Kill (Taser gun) mark 8, a made-up weapon with a lightning bolt kick! I believe in English we call it "harakiri" rather than "karakiri"
Oh, Amar, you never thought paying attention to Elsa's grammar talks was going to be important, did you? King and Bailey wreak havoc upon the earth by turning the adorbs level up to 11.
though I may need some help identifying who's who in it. some are pretty obvious, but there are 5 Sandwich kittens and I can't be bothered top remember the decriptions of all of them, and I can't even remember who all have kids at this point. it's so epic. then comes Bosco, intrepid pup of Bino and Sasha. 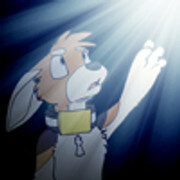 and then...egad THE UNNAMED WONDER THREE CORGSKIES! Last edited by valerio on Thu Mar 07, 2013 3:41 pm, edited 1 time in total. do we get to suggest names for cogskies? if you go for two boys and a big sister, Bishop and Rook could be good names for the boys. I'll open a new thread for the contest. That aside, gratz on your milestone. And awesome picture to go beside it. Stu is an amazing artist. This said, you're not forced to stuff it down your throat, take it easy and if you like it you may have a nice long hobby to pass time.. I'll strap myself down with a few bottles of water and bucket of popcorn and start later tonight on it. We'll see how far I get. You know I always wanted to know what these children looked like and I have to say they all look great. Also, I have a question to ask. What are the characteristics and personalities of both Mortimer and Pixel since Mortimer is a new character and the only thing I know about Pixel is that she is the adopted daughter of Fido and Sabrina and she's a mute kitten? Lastly, congratulations for reaching 100'000 hits. So there are more security/guards right? You said they make up, "30% of the general staff". It's just that the animal/human teams will be more along the lines of 'personal guards' for the eggheads right? Mortimer is definitely the strongest of the new generation and he's well aware of it. Pround and vain like a miniBino, he aspires to be the guardian angel of babylon gardens. He treasures is friends like a wolf treasures his pack members, and respects humans like any good dog. Unfortunately, his management of friendship includes a regimen of training that is not often met with equal joy by his peers. Pixel is a jinx. I mean, it's not that you *must* expect to have problems around her...just don't upset her. Of course, you can't know what can upset Pixel to the point that a manhole will erupt fire and throw the cover at you, but...okay, be prudent with her around. Other than that, Pixel is much like Sabrina -responsible and mischievous, open minded and social but no mama's fool, curious...ok, too much curious for her own good. Nutella and Louise are her best friends because she knows she can drag them into her discovery adventures, hoping that one day she'l be a great detective like 'Doc'. Evildoers beware! Armed security is ALL about animal/human teams, at Xanadu. Again, whereas the civilian furs are female, security are boys. And yes, the special First Line Team is the force assigned to the safety of Prometheus' core staff. Temno went to the table, took a seat and sat down between the Rottie and a Bull Terrier. “Nothing that I can’t handle Gorky. Now gimme some cards, Ferdy." A moment later, a can landed perfectly into his grasp. “I hate you, mutt!” Her voice followed. “She loves me,” he said while opening the can with one claw. He drank a gulp. “And yes, they’re that good. There’s a couple of softies, but I trust the brass’ choice.” He then proceeded to describe the weapons of choices. The dogs listened intently. “Do you think it will actually work?” A German Shepherd asked. He tossed some plastic chips into the pile at the center of the table. “But Gottschalk is a powerful human,” Gorky said, adding chips to the pile. It was 9pm, when the survivors from their first meeting with Prometheus staff walked into their quarters. “Uh, yes.” Now even the collars were being put into the cabinets. “First thing a woman learns in the Army,” Elsa said, speaking for the very first time since their gathering, “is to stop thinking about herself as a woman. We’re uniforms, we’re ranks, we’re killers, we’re comrades.” She stood naked, perhaps the most precious specimen Eddie had ever seen in his life. The poor man was stuttering. She was about to walk in, when a naked Edward Pope stepped in at a brisk pace and an angry frown on his face, followed by Archer, who was sticking out his tongue at her. “’Kid’ my @#£$%!” he was muttering. One could insult him, mistreat him, humiliate him…but being addressed at as ‘kid’ was the supreme insult. He was a man and determined to prove that, especially to his Uncle whose ghost hovered over this new job! Within a few minutes, water was running freely. Even if the showers had the option of being turned into single cabins, for now the group washed without walls between them. The air was filled with water droplets, mist, and the occasional moans from the animals when dexterous fingers rubbed the right spots. “I studied accurately human and animal anatomy to know how to terminate my opponents better,” the wolf said working on the human’s blades. He sounded proud of that statement. The cat shrugged but did as he was told. A moment later, strong paws grabbed him around the chest. Paws large enough to hold him as if he were a stuffed doll. “Much as we’d love to settle down,” Damien said, Marcus scoffing at that, “we’ll just keep moving and stay alive as long as we can.” And he bit into his bread with salami. “No frick,” Eddie said. Frozen plastic explosive was one real killer. While this material was pretty stable, once it had been frozen it better stay frozen! Once you had it out of the freezer, you had about one minute, tops, to recommend your soul to your God. “Yeah!” Flare said, grinning enthusiastically. “Jack’s last intended victim was Adrianne, his old fiancée, a classic! And she worked in this frozen foods market. His final challenge was for us to get there and find the packet he had slipped in a freezer. Now, I don’t like to admit it, but not even I could sniff out the culprit, not in time, not without causing serious damage to my poor nose. So we could only evacuate the market, since Jack had told us everything during business hours. “But Jack had made a mistake: He wanted to make sure that Fred and I would be involved in the explosion. Go on, partner!” he patted the human’s thigh. “Thank you champ: You see, there was only one way to make sure the bomb would be set off, and that would be turning off the power. No energy, no cold, boom! The tension was palpable. Everyone was listening intently, not daring to utter a word. “Lasagna. Three layers of explosive taste,” Flare said. “Speaking of which,” Amar said, putting away his empty plate, “I am having a lady’s heart to make mine!” he walked toward the exit. “It’s awfully late!” Elsa remarked. It’s not like she’s going anywhere, plus you should wash your teeth. The cat tut-tutted. “Cats, nocturnal, remember? And then,” he flashed a grin before picking it with a claw, “You know that where I’m coming from, a male smelling like food is the most sought after. Hej så länge!” and out he went. Archer was wagging like crazy. He had forgotten the last time he had tried to have a relationship with a girl, and this was some occasion to put together duty and pleasure! Last edited by valerio on Sat Mar 09, 2013 2:30 am, edited 1 time in total. bah, curse you and Karlos. first he does his usual really long update at a time I don't have the time to read it before, then you update right before I need to sleep. I was actually hoping to seem some of that twisted humor and enthusiasm from Dasco, otherwise you’re doing a great job. Can’t wait till the next update. Man, I really loved how not only did you have flare and fredrick talk but also have them tell a story. Your the best! Also the team looks to be working together great so far. All I know is that this chapter will be super long. Another thing, when you mentioned 3 different RP neighborhoods all i could do was smile very big. I loved those references that you made. Keep up the fantastic work Val!! I'm sure we'll see that twisted humor with Dasco and Marcus in the future. And then there was the parts with Marcus! Those were great! And the story about the crazy bomber was great and what everyone would do with there money. what everyone would do with there money. not everyone. Marcus derailed the money conversation with the bounty conversation. So he did...sneaky. I like it. Of all the members of the First Line, Jean-Claude Amar Asad was the only one who could truly appreciate the…alienity of this place. A sky of rock, metal and light. Tall buildings illuminated as if millions of colorful fires shone through their windows. A metallic web hanging above, where hundreds of tiny insects ran like busy bees in every direction. And the silence. Even though the cars above hummed softly, theirs was like the voice of an incessant wind in the loud silence of this cavern forged by nature and rebuilt my Man. Amar was used to open spaces, to the sounds of other animals, to the rain season and the powerful winds. His body ached to caress real grass, not a simulation. His senses could be fooled, not so the ancient call of his species. And yet, this place was…ajabu. Wonderful! And still they wondered how had these apes become the masters of this world. Buwarans had had their own nation, even an empire before that, and they were still far from the level of progress intelligent creatures could gain. Amar walked along the stone pavement, avoiding touching the metal-linen road as the warning signs recommended. ‘Danger! Magnetic Fields’ and ‘Danger: LowNo Traffic’ the graphene signs would read in different language and the unmistakable black skull and lightning icon. Amar wondered what kind of a railway this was…and what could ever be ‘LowNo Traffic’!. But, after all, if he started wondering about everything they did here, he’d never stop. He wasn’t here to question authorities, and he surely had better plans for tonight than playing Jeopardy. “Good evening, milady,” he muttered to himself intently, “You have being met me today… No, no, no!” he shook his head, then tried again. “Good evening, milady. We have met today…” Better! Amar remembered how some the humans and their dog soldiers had snickered at him every time he opened his mouth. They were being rude, but it was comprehensible they’d find his speech funny. His claws had started flexing out and in. The African wild cat forced himself to relax. Elsa had never made fun of him, they respected each other. In fact, she had put the bullet into the body of the human who had killed Amar’s mother. Elsa had tried hard to teach her partner the basics of correct speech. Amar had given her a cold ear on that, but both knew he was absorbing each and every word with his prodigious memory. The moment he saw the egg-shaped vehicle suspended at a feet above the road, just by the pavement, he understood: Low-Noise Traffic of magnetic cars. Remarkable. And, speaking of Buwarans… A leopard and a black panther were sitting in the car, together with their human partners. “Zo? Ghet kai?” ‘What? Do we know?’, Amar asked, sheathing his knife. And humans had imposed them this weird habit! “I am Orum, son of Mazar of the Springwater Clans.” He then pointed at the leopard. “And that is my brother, Garum.” He waited for the other feline to answer. Amar nodded, a grim expression on his face: Every promise betrayed, no money, scarce food and the threat of seeing your family decimated if you turned against your tormentors/superiors. Amar recognized something behind that polite request. Curious, now, he walked toward the egg-shaped vehicle. Once he and the panther had embarked, the thing hummed briefly and silently levitated along the mag-road. “So, you guys have not been informed yet?” Garum asked, checking the control panel from time to time, although the car seemed quite capable of driving herself. “We just came. I am—I guess the Captain will inform us, once he’s done lashing us,” Amar barely held a blush in check. Heck, even his peers were more sopshisticated than him! The big cats exchanged an amused glance. Then Orum said, “Yes, he knows how to assert his authority. No wonder he’s your Captain. Now Amar was really curious: Everyone knew that Gottschalk wasn’t a philanthropist…but how far would that human go? Amar’s eyes widened. “The Animal Prince from Dubai?” he remembered him, a jackal, an actual jackal who owned his own fortune in oil thanks to the quirks of his deceased owner, much like the Milton ferrets had inherited Henry’s Milton mortal possession. Amar nodded. He had studied Gabriella Lundberg’s program for the furkindred, a program based on Martin Foster’s principles. Among them, the end of ‘ownership’ for pets, who’d become full family members with the right to choose their human companions if of mature age…or leave them. The maglev car proceeded among the clusters. Amar had all but forgotten about his romantic intentions for then night. He was…what? Puzzled? Awed? Confused? For sure, he had just discovered that his job was part of something so big that he couldn’t see its end. “Why weren’t we being just informed, upon coming here?” he asked, his eyes lost in his own thoughts. “I feel sick,” was Edward Pope’s first comment, once he had pressed the ‘pause’ button. There was a limit even to how much information one could take in one swipe. He also felt like drinking a whole bottle of Grappa. “Talk about motivational speech,” Dasco muttered. He knew he looked, at best, dumbfounded, but he couldn’t help it –and heck, he had been watching over some weird top-secret stuff! But that stuff was supposed to stay secret, hidden forever, either because it was too dangerous or because it would wreak havoc in the relationship between people and their Governments. There was only one of them who was actually smiling. Marcus. “All my life,” he said. All heads turned to him. Damien looked with utter amazement at the single tear that flowed from his partner’s eye. A tear from a creature who had never shed any, not even for his own father’s demise. “I will die a hero. My name will be passed among those who helped build a new world. The shamans will name the finest warriors after me. My skin will become part of a totem” He drew a deep breath. One could almost hear his powerful heart beating like a drum in his chest. “No frick,” Eddie said. The faces of his colleagues spoke out loud enough. Their old lives were over. Even when or if they’d retire, they could never go back to anyone they knew, unless this master plan, Codename: Arcadia, would really speed up. They would be stuck with their job until they could do it, that much was clear, and not because they’d be forced to –not even Gottschalk was so stupid as to force a bunch of top killers and hackers and what else to do their job…no, they would keep on working at Xanadu because it was that or abandoning their own actual chance to write history. That wolf was right, Eddie thought: One day kids would read about them and their adventures and play pretend to be them. One day, there would be books about Xanadu and the people who protected it. Edward Pope Jr. couldn’t dishonor his family name by dropping this chance. Even if it would cost him his old plans to find the murderers of his father and make them pay! Amar had to focus hard on a question that had lingered in his mind, in the turbulent sea of so many more questions! “What’s with this ‘Republic’? Where does it lay, to be so…’close to the Western World’? “But what really matters is,” Orum went on, “Is that the Mexican Government never claimed back that place, in fact no one did, not even the cartels. “So, where were you going?” Garum asked. Last edited by valerio on Wed Mar 13, 2013 3:11 pm, edited 1 time in total. I have no problem in repeating it: *everyone* will have their rightfully deserved moment. It's a question of the *right* moment. I just wrote a base page for H!tS on TV Tropes. I...I don't know what say, Kitch. 'Thank you' a million times is not enough. Oh, and if you tell me how to update the page, I'll happily provide. *bows then hugs* thank you for making my week! You have to be registered on TV Tropes, which is simple enough. When you do, there's an "edit page" button on the top of the page. I once started to try reading it for fun, before realizing I had spent something like five hours on it. I will devote myself to it on the weekends. I gladly accept suggestions in PM about the 'how-to' on adding tropes, as this will be my first experience with TT. Indeed TV tropes is a double edged sword, it's good for analysis and finding out whether or not a particular work suits your tastes. I found the Housepets! webcomic thanks to TV Tropes as a matter of fact. It is also really easy to burn a whole day and a half just mindlessly clicking through links, they even have a term for it called "wiki walking." Anyways, the updates are awesome! I like how you are writing in all of the new characters and delving into them little by little. I can't wait to see further interactions between all of these characters because they are all so dynamic. 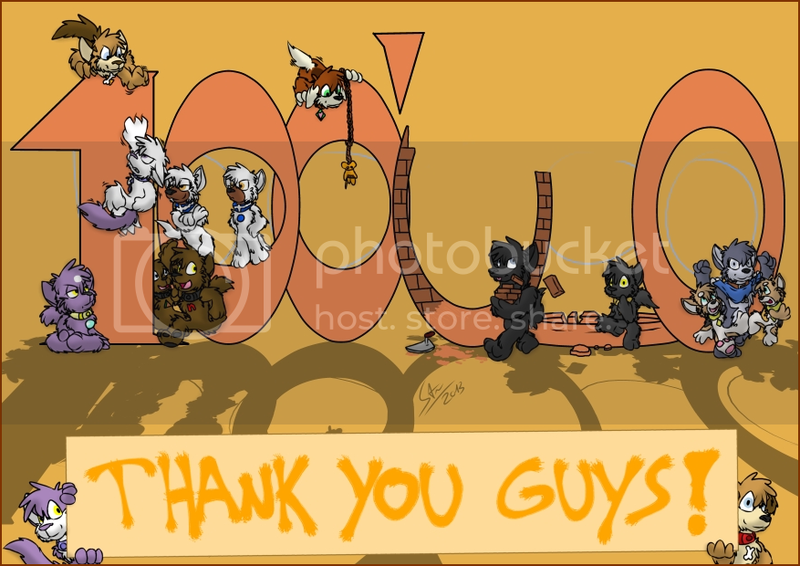 Also, since I was a little busy and missed the party bus, here's a late congrats on your 100,000 comic views! I'm looking for one of the illustrations by Stu. For some reason I can't seem to find it anywhere. It's the one where Grape and Peanut are reacting to awkward looks after coming out with their relationship. I am loving how you write Amar! I'm so excited to see his big screen time!